Emma Goldman is known as a rebel, an anarchist, an ardent proponent of birth control and free speech, a feminist, a lecturer, and a writer. Born on June 27, 1869, she became known as Red Emma both for her heritage and her political involvement. Emma Goldman died on May 14, 1940. Emma Goldman was born in what is now Lithuania but was then controlled by Russia, in a Jewish ghetto that was largely German Jewish in culture. Her father, Abraham Goldman, married Taube Zodokoff. She had two older half-sisters (her mother's children) and two younger brothers. The family ran an inn which was used by the Russian military for training soldiers. Emma Goldman was sent when she was seven to Königsberg to attend private school and live with relatives. When her family followed, she transferred to a private school. When Emma Goldman was twelve, she and the family moved to St. Petersburg. She left school, though she worked on self-education, and went to work to help support the family. She eventually became involved with university radicals and looked to historical women rebels as role models. Under suppression of radical politics by the government, and family pressure to marry, Emma Goldman left for America in 1885 with her half-sister Helen Zodokoff, where they lived with their older sister who had emigrated earlier. She began working in the textile industry in Rochester, New York. In 1886 Emma married a fellow worker, Jacob Kersner. They divorced in 1889, but since Kersner was a citizen, that marriage was the basis for Goldman's later claims to be a citizen. Emma Goldman moved in 1889 to New York where she quickly became active in the anarchist movement. Inspired by the events in Chicago in 1886, which she had followed from Rochester, she joined with fellow anarchist Alexander Berkman in a plot to end the Homestead Steel Strike by assassinating the industrialist Henry Clay Frick. The plot failed to kill Frick, and Berkman went to jail for 14 years. Emma Goldman's name was widely known as the New York World depicted her as the real brains behind the attempt. The 1893 panic, with a stock market crash and massive unemployment, led to a public rally in Union Square in August. Goldman spoke there, and she was arrested for inciting a riot. While she was in jail, Nellie Bly interviewed her. When she got out of prison from that charge, in 1895, she went to Europe to study medicine. She was back in America in 1901, suspected of participating in a plot to assassinate President William McKinley. The only evidence that could be found against her was that the actual assassin attended a speech Goldman gave. The assassination resulted in the 1902 Aliens Act, classifying promoting "criminal anarchy" as a felony. In 1903, Goldman was among those who founded the Free Speech League to promote free speech and free assembly rights, and to oppose the Aliens Act. She was the editor and publisher of Mother Earth magazine from 1906 until 1917. This journal promoted a cooperative commonwealth in America, rather than a government, and opposed repression. Emma Goldman became one of the most outspoken and well-known American radicals, lecturing, and writing on anarchism, women's rights, and other political topics. She also wrote and lectured on "new drama," drawing out the social messages of Ibsen, Strindberg, Shaw, and others. 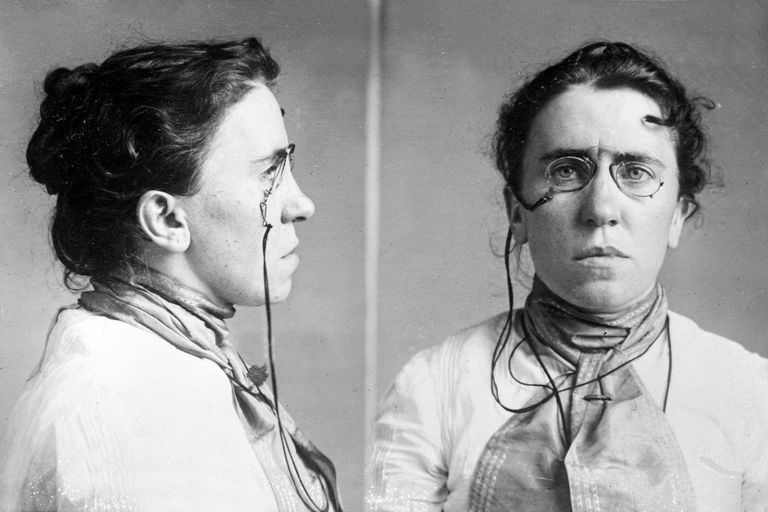 Emma Goldman served prison and jail terms for such activities as advising the unemployed to take bread if their pleas for food were not answered, for giving information in a lecture on birth control, and for opposing military conscription. In 1908 she was deprived of her citizenship. In 1917, with her long-time associate Alexander Berkman, Emma Goldman was convicted of conspiracy against the draft laws, and sentenced to years in prison and fined $10,000. In 1919 Emma Goldman, along with Alexander Berkman and 247 others who had been targeted in the Red Scare after World War I, emigrated to Russia on the Buford. But Emma Goldman's libertarian socialism led to her Disillusionment in Russia, as the title of her 1923 work says it. She lived in Europe, obtained British citizenship by marrying the Welshman James Colton, and traveled through many nations giving lectures. Without citizenship, Emma Goldman was prohibited, except for a brief stay in 1934, from entering the United States. She spent her final years aiding the anti-Franco forces in Spain through lecturing and fund-raising. Succumbing to a stroke and its effects, she died in Canada in 1940 and was buried in Chicago, near the graves of the Haymarket anarchists.